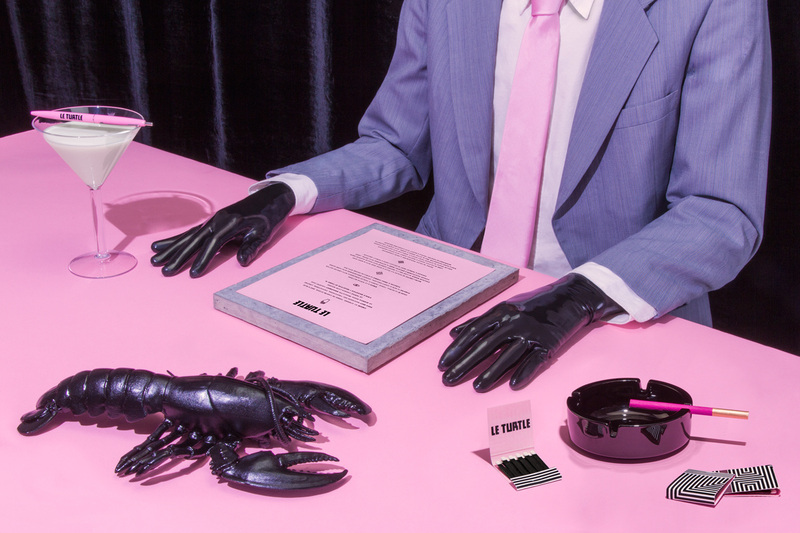 The striking, hot pink and black identity and web design also marks several firsts for designers Leta Sobierajski and Wade Jeffree. Separately, the two are responsible for some of the most recognizable design projects created in the past few years—Sobierajski working independently as an art director and designer, and Jeffree designing at Sagmeister & Walsh, Mother, and now on his own. And though they’re a couple and have explored their relationship as partners and designers in the Complements Project, this was the first time they decided to work together for a client. 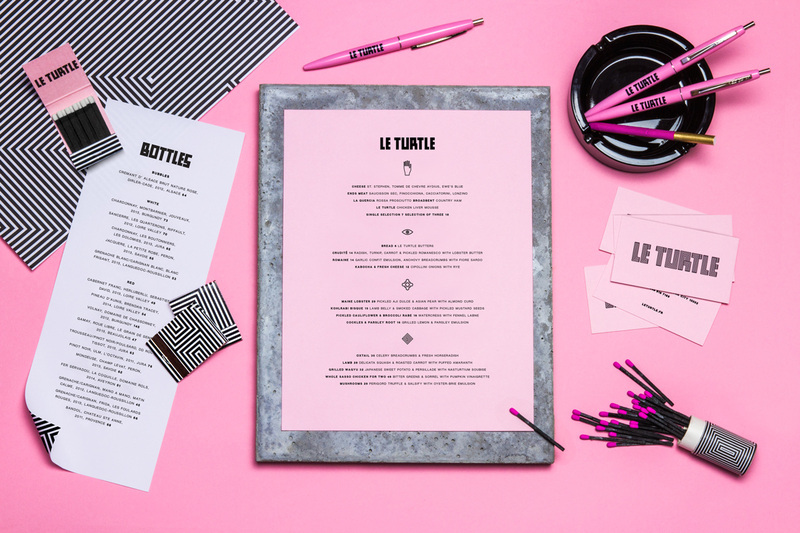 Sobierajski and Jeffree describe Le Turtle’s owners Somer and Quirarte as pretty easy going guys; after all, the restaurant’s name started as a joke between them—there’s no such word in French. Even so, when they approached Sobierajski late last summer they gave her roughly two weeks to deliver the work. Though Sobierajski had never worked on a restaurant before, the mix of Somer and Quirarte’s humor, absurdity, and no-joke business acumen piqued her interest (besides, she isn’t one to pass up an exciting challenge; she had never designed a website before she did Eye on Design). However, at the time the job came in she was busy working in Serbia, so she knew she was going to need some help stateside to meet the deadline. She and Jeffree had recently passed a major Complements Project milestone, turning the series of portraits into a book. They clearly knew how to work together, but was it risky to mix business with pleasure? Sobierajski and Jeffree might not have known it at the time, but their mix of cool-headed decision making and the kind of unfiltered honesty you can only have with someone you love made for an ideal working relationship. And with the six-hour time difference between New York and Serbia, Sobierajski was able to send Jeffree her work before going to sleep at night, he’d receive it when he came home from his day job, and then turn it around and send back to her so she’d have it first thing in the morning. An added bonus to swapping the same file back and forth? They were able to see one another’s half-finished ideas and discarded work, often picking up on threads of thoughts and running with them. Some of the final design elements actually came from Jeffree’s offcaststhat Sobierajski saw a glimmer of something great in. But there were several visual elements there from the start, especially Le Turtle’s Carlo Scarpa-inspired interior design, evident in the tiled entrance, the blocky concrete steps, and keen attention to materials. Jeffree translated these visual cues into a linear word mark that references the “stepped” element in much of Scarpa’s architecture. And let’s not forget that touch of pink. Aware that being waited on by prison jumpsuit-clad servers in a predominantly concrete dining room might come off as harsh, to say the least, Le Turtle’s neon lights, pink velvet accents, luscious leather seating, and travertine bar break up the room and give a nod to Scarpa’s “sensuous material imagination.” Jeffree and Sobierajski even wanted to make the menus out of marble, but the budget-minded restaurant owners eventually talked them down to cardboard and pink paper, held together with a simple rubber band (the look is more effective than it sounds). Sobierajski readily admits that Jeffree excels at print and type design, and he returns the favor, gushing over her eye for art direction. The complements continue: she balances Jeffree’s skillful concept work and overall project ideation with her innate ability to see how all the disparate visual elements in a project will come together in the end, something that’s evident in the branding on the whole, but especially Le Turtle’s awesomely weird website. Designed as an entry into the Le Turtle world, the mystical symbology and seemingly unconnected bits of video are scattered about like breadcrumbs, enticing the adventurous eater to realize the full experience in person. 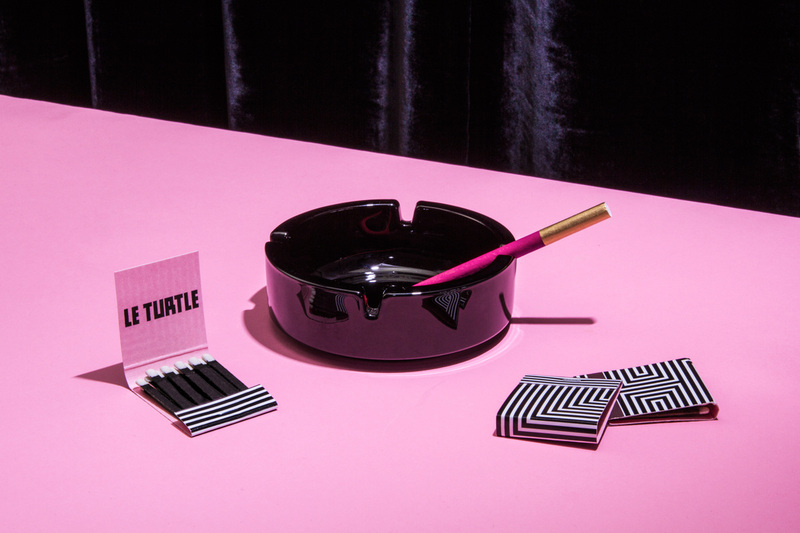 For their part, Sobierajski and Jeffree completed their Le Turtle design pilgrimage with a very special meal at the restaurant earlier this spring. It wasn’t just a final celebration after working so hard and fast on their first commission as a couple. Though they couldn’t have know it at the time, the “VIP” table on the restaurant’s elevated, concrete platform area would also be the location of their wedding celebration. After completing the design work for Le Turtle, Jeffree proposed to Sobierajski and they were married a few months later in City Hall. Design match made in heaven. You’ll probably dig: Do Design Partners Who are Also Life Partners Have an Unfair Advantage?